Would sir care to try on a dry martini for size? Endless lines. Pushy crowds. Hearing "The Twelve Days of Christmas" for the umpteenth time in a matter of hours. Spend a little time shopping this holiday season, and odds are good you'll want a good stiff drink. Not that you need to abandon your basket to grab one. More clothing retailers are branching out into the cocktail scene, offering customers the opportunity to pause mid-shopping trip for a drink and small plates of food. Just hang a right at menswear and walk past women's shoes to the in-store bar. Saks, Urban Outfitters and Brooks Brothers are among the brands that have recently announced plans to build out bar and restaurant spaces in stores. Old hats at the restaurant-retail combo are expanding, too. 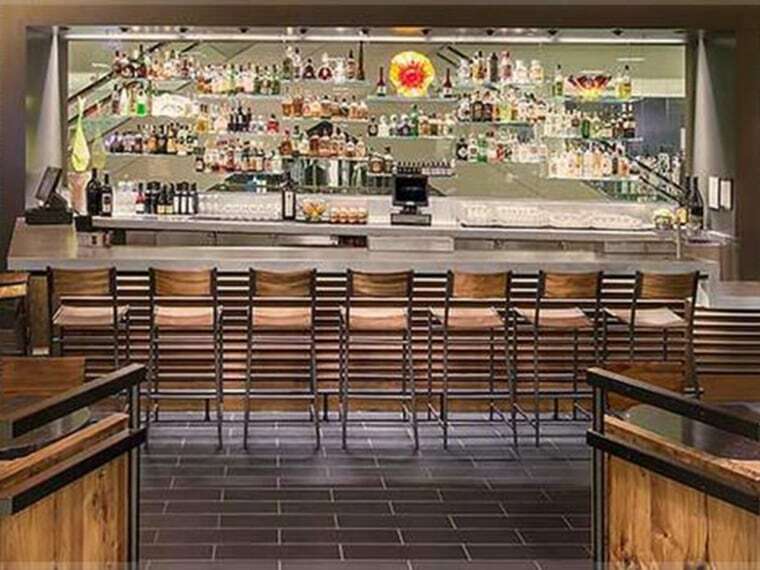 Over the past year, Nordstrom has doubled its food-service operations that include a full bar, opening six new lounges and restaurants. Handcrafted, seasonal cocktails at new lounge Habitant — in the middle of the shopping floor in the Bellevue Square mall in suburban Seattle — proved so popular that Nordstrom made them available at all locations serving alcohol, said Vincent Rossetti, national director of restaurant division operations. Tommy Bahama, which already has restaurants in 14 stores, began testing a new bar and café space in Hong Kong earlier this year. "We think that's a format that would do well in the U.S. and other parts of the world," at those stores that don't have a restaurant, said Rob Goldberg, senior vice president of marketing and restaurants. The brand's year-old flagship in New York City has a separate bar a floor below its restaurant, where shoppers can sip on house-made barrel-aged cocktails. And in recent years, Tommy Bahama stores have introduced a holiday program to greet shoppers with a free drink or appetizer, such as coconut hot chocolate or eggnog martini. "That in and of itself really communicates a welcoming feeling," Goldberg said. "People feel like they can linger, so they tend to dwell a little longer. Their guard comes down." Shopping under the influence isn't a new concept, said Noah Rothbaum, editor-in-chief of Liquor.com. It's long been common for visitors to designer ateliers and bridal salons to be offered a glass of Champagne or a cocktail. But the trend has been expanding in recent years to small boutiques and now, larger stores. "It's almost trickling up," he said. The key difference: In big stores, the drinks are less likely to be free. Devoting space to bars and restaurants is somewhat more risky, said Paco Underhill, founder of consumer behavior research firm Envirosell. A store may not generate as much revenue from a bar than if it had extra racks of merchandise in that space. Yet it's more of a moneymaker than common areas with just comfy couches and a TV, while achieving the same aim: Get shoppers to stick around. "If you can get someone to sit and gather their thoughts, it gives them a second wind," he said. Bars also make the wait more tolerable for tag-alongs (especially husbands). "It's often a very convenient place to park your two-legged pet while shopping," said Underhill, who is also the author of "What Women Want: The Science of Female Shopping." "Think of it as a male crèche." The catch, of course, for shoppers is that getting buzzed makes them less disciplined, said April Benson, a New York-based psychologist who specializes in compulsive buying disorders. They can lose track of spending, and be more easily influenced by friends and salespeople to buy items they otherwise wouldn't. "For people on a budget, it's not so good to have your inhibitions minimized," said Benson, who is also the author of "To Buy or Not to Buy: Why We Overshop and How to Stop." Her suggestion is to keep shopping and drinking separate, or at least, wait to drink and dine until after you've shopped.